Do you have a scrap truck that no-longer runs? If you do, and repairing it will cost you more than the truck is worth, you will most likely be thinking of how on earth you are going to get rid of it. Common sense would suggest that you can’t sell it. People don’t buy scrap trucks. Giving it away would be difficult enough. However, common sense isn’t always correct sense. And the fact of the matter is that if you live in Brisbane, there is someone who will gladly buy that truck from you. QLD Wreckers are Brisbane’s leading truck wrecking company, and we are always looking for more automobiles to wreck. And we are so keen on procuring them that we are more than happy to part ways with up to $15000 if that truck is in good enough condition. However we will buy your truck even if it is completely totalled in an accident. The whole process is extremely quick. You can expect to have your truck sold within the same day that you contact us. Our customers are extremely important to us. We strive to provide the most hassle free, stress free and convenient service to anyone doing business with us. And part of that mission involves our efforts to make sure that anyone selling to us gets the more money than they would get via any other auto wrecking business. That is why we don’t charge any extra for the removal of any automobile. There are companies that buy scrap automobiles who do either of two things. One is they offer less money to cover the cost of removal. The other is they require their customers to hire a tow truck to transport the vehicle to their premises before they buy it. However, here at QLD Wreckers we understand that this results in people getting less money at the end of the day. That is why we perform free removal services for anyone in the Queensland area. This includes Brisbane, Toowoomba, Gold Coast, the Sunshine Coast, Rocklea, Warwick, Ipswich, Rockhampton, Caboolture, Townsville, and Logan. We are fully certified and registered auto wreckers. When you sell your truck to us you are helping the environment. We recycle all the hazardous and toxic materials that are present in the vehicle so that none of them get into the ecosystem to do any damage. What’s more, the recycling of steel reduces the need of mining for it. This reduces pollution and the release of carbon dioxide, which is a major green-house gas. So if you sell your truck to us, you are doing your bit to make the planet habitable for future generations! At Qld Wreckers, we want everyone to be able to take advantage of our hugely superior auto-wrecking and car removal services. If we were to specialise in a select few brands, makes, or models of truck, this would not be a possibility. That is the main reason that we don’t specialise in makes, and are more than happy to pay top cash for any brand or model. Everyone deserves to have access to a means of selling their scrap truck. Whether your scrap truck is a Hino, Volvo, Mazda, Toyota, Mitsubishi Fuso, Canter, Isuzu, Mercedes, Nissan Diesel, Mack, Freightliner, TATA, Scania or a Ford. We will buy it off you and wreck it. Seeing as we are in the business of buying scrap trucks, we will gladly buy any truck whose best days are far behind them. Has the truck in question has been severely damaged as a result of accident? Or has it simply aged to the point where it is too costly to maintain? Maybe it has been in a fire, or a flood. Whatever state of disrepair that it is in, we will buy it off you regardless. Do you need to replace a part on your truck in order to get it up and running again? We here at QLD Wreckers understand your need to have a fully functioning truck so that you can go about your business. That is why we have a huge inventory of used truck parts in Brisbane at very competitive prices. If you know exactly what spare part you need, while that is great, our staff is always here to help you to find the suitable part for your truck or other heavy vehicles if you don’t know. Don’t buy that part brand new. Used parts are just as good, and they are affordable as well. All of our truck parts come with a warranty and are of a very high quality. Just contact us at the phone number below or fill out the form on our website. 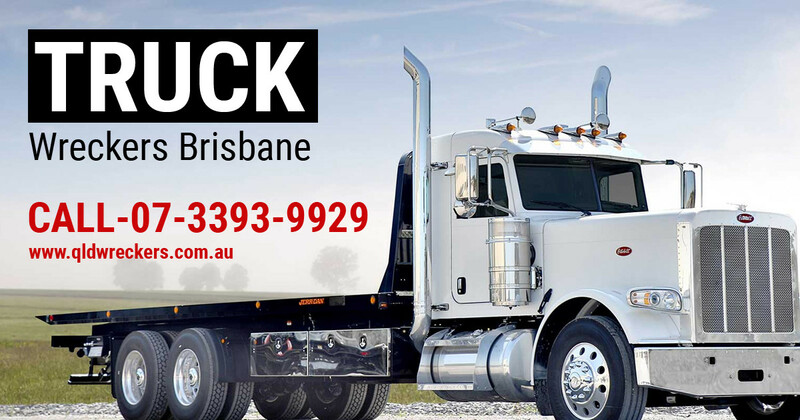 If you have read this far, and you have made the decision to sell your old truck to us here at QLD Wreckers – licensed truck dealers, you should be commended for your superior decision making skills. The next step is as easy as pie. Simply give us a call at 0416 615 100 and one of our expert staff members will assist you straight away. However, if you do not like using the phone for this purpose, we have an alternative for you. You can leave the details of your vehicle via our quote form, we will get back to you on that. Simply leave your contact number with the other details and we will give you a call at a suitable time. Once you have done that, and gotten our free no obligations quote, and you choose to accept the offer, we will arrange to come to your place or where-ever you and your car are at a time that suites you. After inspecting the truck to make sure that it does indeed exist, we will pay you on the spot and take the truck away.